Camp is located in Covington, Georgia is known for its modern amenities with an air-conditioned dining hall and permanent platform tents with electricity. Bert Adams serves thousands of weekend campers in addition to Scouts BSA, Cub Scouts and Webelos at Summer Camp, Cub Scouts for Cub Adventure Weekends throughout the year, and Cub Scouts for overnight summer camp. This camp is located in Blairsville, Georgia and is visited by Troops from all over the southeast. It is a sought after location with cool temps, gorgeous mountain views, and whitewater rafting nearby. 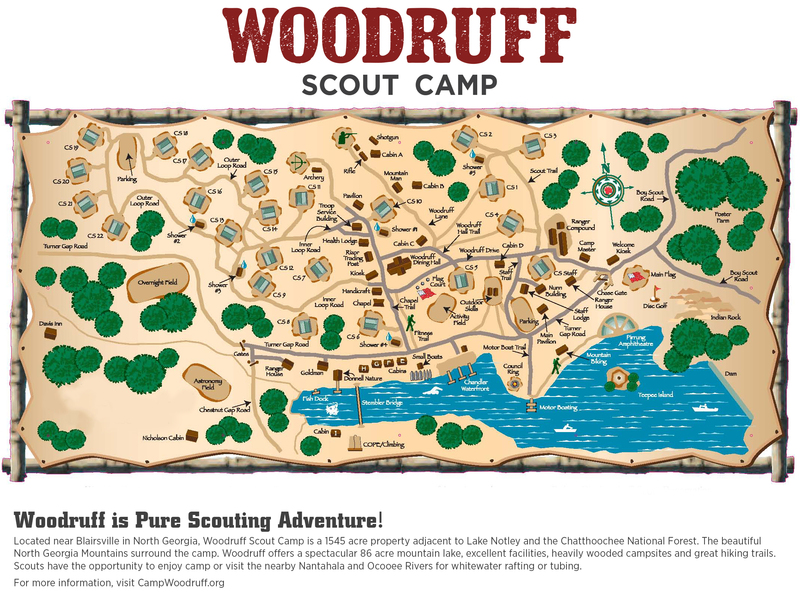 Woodruff hosts eight weeks of Scouts BSA Summer Camp and thousands of campers on the weekends throughout the year. This camp is 400 acres of lakefront property leased from the Army Corps of Engineers by the Atlanta Area Council. This nearby camp is used throughout the year for weekend camping, day trips, and other Scout outings. At the Allatoona Aquatics Base, Scouts can enjoy aquatic activities including canoeing, rowing, sailing, skiing, swimming, motor boating, and lifesaving.